Caryn Luxton Design is the company the Australian Fashion Industry turns to for pattern making, product development and local and offshore clothing manufacture. support and expert advice you will need to transform your designs into product success stories. Our diverse range of clients includes some of Australia’s most iconic fashion labels, clothing manufacturers, up and coming designers and new business start-ups. 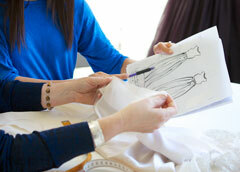 Our services include pattern making, sample making, production grading, spec sheets, fabric and accessories sourcing, Australian and offshore clothing manufacture. Our goal is to empower our clients to help realise their creative, production and economic goals. Share in our experience. Helping people who are new to the industry is a big part of what we do.